The corporate tax cut is permanent, but most individual provisions of the Tax Cuts and Jobs Act (Pub L 115–97, 131 Stat 2054) are set to expire for tax years beginning after December 31, 2025. These expiring provisions will tax the ingenuity and patience of estate planners and their clients. What to do? The legislation doubles the applicable exclusion amount (AEA) from $5 million to $10 million plus cost-of-living adjustments ($11.2 million in 2018) for gifts made and decedents dying in 2018–2025, but the AEA reverts to $5 million plus cost-of-living adjustments in 2026. IRC §2010(c). As a result, practitioners now have no idea what the AEA will be on a single client’s death, let alone on the death of the surviving spouse for married clients. Fortunately, the standard trust plan for married couples copes fairly well with the current uncertainty. Basically, the trust document gives the surviving spouse a marital deduction qualifying income interest in all or most of the decedent’s trust. On the first death, the survivor or trustee makes a QTIP election for all or some (or none) of the decedent’s trust as desired or needed to minimize or completely avoid estate tax on the first death. That amount or share will then be included in the survivor’s estate. But it remains a challenge. Unless the $10 million AEA is made permanent, the person making the QTIP election can’t assume it’s safe to include in the survivor’s estate more than the sum of $5 million (plus cost-of-living adjustments) and the deceased spouse’s unused exclusion (DSUE) amount. The DSUE amount may be as much as $11.2 million (plus cost-of-living adjustments after 2018) if the first death occurs before 2026 and the QTIP election is made for the entire decedent’s trust. In that case, none of the decedent’s AEA is used on the first death. However, for a couple with more than about $17 million in community property on a first death in 2018, the survivor or trustee shouldn’t make the QTIP election for any of the decedent’s property, which would cause inclusion in the survivor’s estate of an additional amount that could exceed the DSUE amount if assets appreciate. This strategy may not take full advantage of a possible second step-up in basis on decedent’s trust assets if the survivor dies before 2026 or the $10 million AEA is made permanent, but it does minimize estate tax on a second death after 2026 if the $10 million AEA isn’t extended. On the other hand, wealthy couples and individuals with donative intent should consider making lifetime gifts up to $11.2 million (plus cost-of-living adjustments after 2018) to lock in the current elevated AEA before it reverts in 2026. The legislation permanently provides that a future reduction in the AEA won’t trigger estate tax with respect to lifetime gifts in excess of the AEA in effect on the donor’s death. IRC §2001(g)(2). In other words, there will be no “clawback” of excess gifts into the donor’s estate. For example, a couple with $50 million in community property could give away $20 million using almost all of their available AEA. On the first death, the survivor or trustee would make the QTIP election for almost all of the decedent’s trust ($15 million). This at least postpones the day of reckoning until the second death, when about $30 million will be included in the survivor’s estate. Clients with charitable intent could reduce or eliminate estate tax by making charitable contributions, using a formula clause that reduces the estate tax to zero regardless of the AEA in effect on the second death. These observations highlight the estate planning challenges and opportunities under the Tax Act. Practitioners are reminded that the first priority is to obtain the desired disposition for the client. Large lifetime gifts and charitable gifts should be made only if that’s what your clients truly want. For more on the standard trust plan for married couples described above with forms, check out CEB’s Drafting California Revocable Trusts, chap 14. For more on administration of a moderate married settlor trust ($15 million or less) with no tax issues, see CEB’s California Trust Administration, chap 13A. An overview of the new tax law changes is in the January issue of CEB’s California Business Law Reporter: Barrett, A Summary of HR 1 (aka the Tax Cuts and Jobs Act). 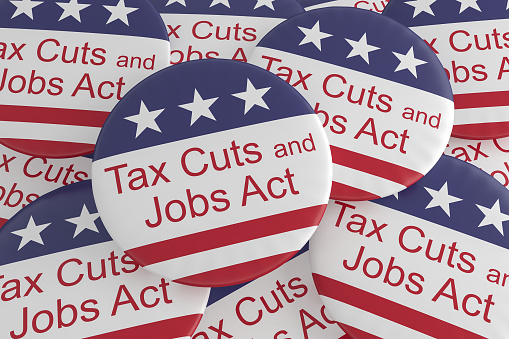 And check out summaries, resources, and a free webinar and videos on the 2018 Tax Cuts and Jobs Act on ceb.com. Check out other CEBblog™ posts on estate planning.